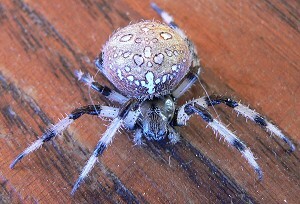 The hummingbirds have finally left, the white-throated sparrows are back and we saw wonderful, colorful spider. I filled the hummingbird feeders one more time – to make sure there would be food for any strays – but we haven’t seen even one. Instead the feeders are full of bees – their wings make a sound like wind moving over the lip of a bottle as they fly up to the holes. It took us a long time to figure out where that odd sound was coming from. The spider was on some of the seeds I had collected – so not quite from the farm. It was a Shamrock Orb Spider – here’s the picture. We heard a Great Horned Owl early Sunday morning, and then last night, on our walk, we heard a huge flock of crows harrassing it, and heard it hooting. 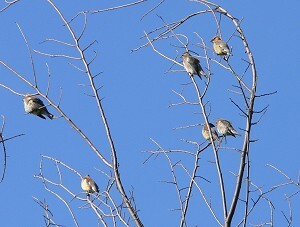 They were down in the bowl – too far down to see much except when they all flew to a different tree. What a comotion! We heard a grouse drumming – for the first time since the spring. And we saw lots of migrants – a flock of flickers eating dogwood berries along the edge of the Cat’s Paw Prairie, several flocks of Canada Geese flying over, more cedar waxwings, and bluebirds everywhere. I’m still collecting a few seeds, and we’ve started cleaning them. I’ve collected many more this year, so there’s a lot of work yet to do. I ran out of floor space for drying in the basement, so I’ve moved upstairs – now that is pretty full too. 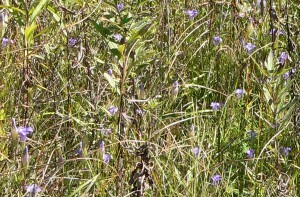 The Fringed Gentians are in bloom – the big patch in the main wetland is huge this year, with lots of small plants with just a few flowers scattered through the grass. And the patch at the lower end of East Center Valley – the one we planted – is getting bigger. I saw a large falcon flying above the Narrows Prairie. It was barred underneath, had a distinct dark facial stripe, and a white bar at the end of the tail – I think it must have been a Peregrine Falcon.